One of Fiji’s national treasures, the Fiji banded iguana is one of the few iguana species not found in the Americas. The male is strikingly coloured with light blue to white bands on a bright green background. Females are more uniformly green with occasional faint banding or spotting. Both sexes have yellow underbellies and yellow-rimmed nostrils. 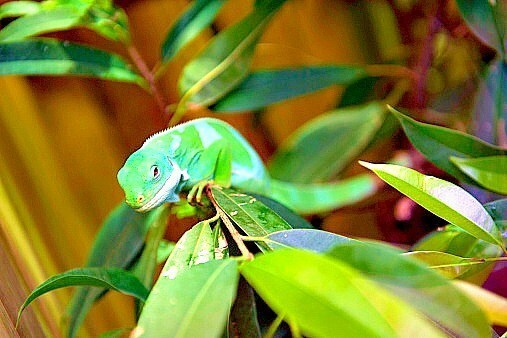 Like other iguanas, they’re able to change their skin colour to blend in with their surroundings. When threatened, the iguanas turn black, making it clear they’re not to be messed with! Their long, spindly toes end in claws, and these help them to climb the trees that they live in. They have a very short crest that is only 0.5 centimetres high and grow to 60 centimetres long (half of this is tail).